Jim Morrison, lead singer of The Doors and forever a member of the 27 Club, was an amazing talent that died far too young, but during his brief career as singer, musician and poet, he revealed an interest in the occult that is reminiscent of other musicians of the time, such as Paul McCartney, and of bands that came on the scene later such as Black Sabbath, who used occult symbolism as part of the stage act and Led Zeppelin who incorporated signs and symbols into the album art of Led Zeppelin IV. Morrison certainly embraced the search for hidden knowledge, pushing the boundaries and eventually walked through the doors of perception, getting the name of his band from a poem by William Blake entitled The Marriage of Heaven and Hell, a poet and artist who was also no stranger to Freemasonry. The same Blake poem also inspired Aldous Huxley’s acclaimed book The Doors of Perception, which details Huxley’s experiences of taking the drug mescaline and the use of the drug as a way of opening the door into a world that gave a deeper experience and insight into forbidden knowledge, a pathway to enlightenment. Morrison embraced his own personal experiences in this mould, using drugs, alcohol and searching various spiritual avenues, and according to his biography which was co-written by his friend Danny Sugarman, he married a girlfriend in a Celtic-Pagan ceremony and read countless books of poetry and philosophy. It was only natural that certain occult themes filtered into Morrison’s poetry, some poems conjuring up vivid imagery of what Morrison expected to see on the other side of the door. Morrison’s poetry is perhaps best accessible on the album An American Prayer, which was released in 1978, seven years after his death in Paris. Poems such as Ghost Song, The Movie and Curses, Invocations all provide an almost primeval image of death and present ideas of a rebirth of sorts, the poetry conveying Morrison’s beliefs and obsession with the premonition of death. Morrison’s other poems also touch on occultist imagery, such as The Lords, in which he told us to ‘Fear the Lords who are secret among us. The Lords are w/ in us. Born of sloth & cowardice.’ These sinister ‘Lords’ being God-like figures that control us, something that is echoed in today’s conspiracy theories. The album that was eventually released in 1978 was different from the one Morrison originally envisioned; Morrison had supposedly approached renowned composer Lalo Schifrin to compose music for the album that would complement the spoken poetry, and the original cover was designed by T.E. 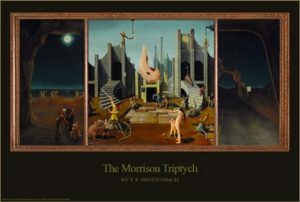 Breitenbach who created a Triptych painting; a three panelled presentation of the themes displayed in Morrison’s poetry. Triptych paintings commonly appear as a style in early Christian art, and Morrison’s ideas of life, death and rebirth were inserted into the Triptych; the first panel reveals a moonlit beach with naked couples dancing along the shore, and on the beach a baby smiles at the world as elderly people gather around the child. The middle panel reveals a futuristic and Surreal city and the last panel shows the view through a windshield of a desert highway at night, which may refer to the incident told in Ghost Song where, as a child, driving through the desert with his parents, he witnessed a road accident that involved an overturned truck with dead and injured Indians; ‘Indians scattered on dawn’s highway bleeding, ghosts crowd the young child’s fragile eggshell mind…’ This incident was referred to in the song Peace Frog and became a dominant theme in Oliver Stone’s biopic of Morrison The Doors, which also reverberated the themes of life, death and rebirth, themes that dominated his poems and lyrics. As one of Morrison’s last works, his poetry album symbolises the rebirth he was looking for; as a serious poet who sought hidden knowledge.